Article 6. 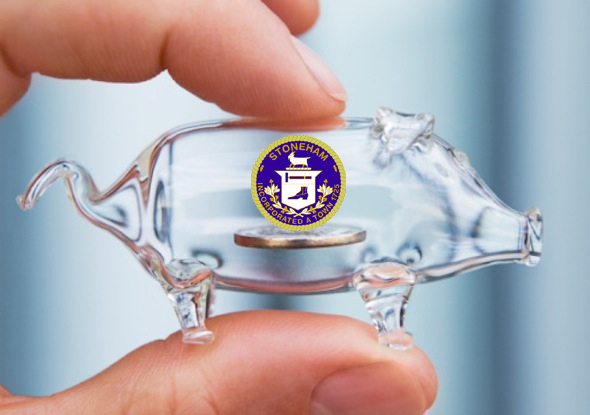 To see if the Town will vote to raise and appropriate from taxation or by transfer from available funds, such sums as may be necessary to defray Town charges for the ensuing year, including debt and interest and a reserve fund, or do anything in relation thereto. On Monday, May 4th the town budget for fiscal year 2016, or Article #6, was Indefinitely Postponed (IP’d) to a time in June. The budget is something that historically has passed, almost without question, over the past 15 years. There are several rumors floating around town regarding why this vote was IP’d, and we would like to provide you with our explanation. For the last two years the Board of Selectmen (BOS) has been working very hard to provide full financial disclosure to taxpayers. For the past 15 years our entire town budget, currently at $70M, was presented to Town Meeting as a one page document made up of 39 line items. There was no explanation next to any of the line items presented in this single page document to explain how a department arrived at their budget or supporting details regarding what made up the final number. This is something we sought to change. The Finance Board (FAB) together with the BOS over this past winter arranged for all town department heads to attend a presentation by the Town Administrator of Northborough to present a financial reporting model we wanted to adopt. It was very user friendly and is an award winning methodology of financial reporting. We were clear that this was the format we wanted. In February the BOS received the same one page budget. We never voted on it, we asked that more detail be provided. To his credit, the Town Administrator (TA) has been working to provide us with the format we requested. However, the BOS saw the revised budget, in its entirety, for the first time on Tuesday April 28th. Although it was closer, it was not in the format we were promised and it still left too many unanswered question. That same night we received the updated budget we were also presented with an emergency request from the DPW to buy two new trucks & a backhoe totaling $ 300,000. Their proposal was to take money from the Sewer Enterprise Fund reserves and Chapter 90 money, funding that is earmarked by the state to repair roads. Once again we were put on the spot trying to find $300,000. The very next day we received an email from our TA informing us that the water rate was being increased by $1.00 from ($5 to $6 per 100 cubic FT.) or 20% to offset the loss of revenue from Atlantic Gelatin, even though we have yet to see any financial statement of the actual cost to the town. We had reserves of over $1 million in each of the Water and Sewer funds (W&S) last June and they have been depleted to around $300,000 without financial backup. We were told that revenues came in lower than expected, again without financial backup. The MWRA bills the Town of Stoneham for last year’s W&S usage meaning that our assessment for next year should be much lower than it was for this year. The FAB has been requesting details on this since February. They too reached a point of frustration on Thursday April 30th when they received the same budget that we received two days prior. Like us they could not, in good faith, vote favorably on the budget four days before Town Meeting without time to review and ask meaningful questions. With the exception of one member, the FAB voted to IP Article # 6. The majority of the BOS also felt strongly that we could not advise voters to accept the budget put in front of them for a vote when we did not have the time or information to go through the budget, ask questions, and receive answers ourselves. Therefore, in a vote of 3 in favor, 1 against, and 1 absent the BOS also voted to IP Article #. • The traditional one page budget, we felt was unacceptable on its own, is a summary of the 95 page budget presented at Town Meeting, which wasn’t included in this linked budget making it impossible to reconcile. On page 9 there is a pie chart titled FY16 Budget Expenditures, nowhere on that page is a reference to the total budget. In fact, it is broken down to only 11 categories from the 39 of which we are accustomed. • We were greatly concerned that the water rate is being raised 20% next year. On page 73 the department total for FY16 is $4,171,509 which is $85,616 less than the $4,257,125 budgeted in FY15. Additionally the MWRA charge for FY16 is $3,381,303 which is $109,669 less than the $3,490,972 budgeted in FY15. According to the pie chart on page 3, water projected revenue is $4,884,031 indicating an anticipated profit of $712,522, but its unclear if that includes the rate hike as this budget came out a day before the water rate increase was announced. The Water Enterprise Fund is not listed for 2015 so we can’t tell if we lost or made money on water. This is one area we felt more information was required to make an informed decision, especially in light of the huge water increase proposed. • Line item 440, Sewer, on page 71 shows personnel budget of $665,870 yet line 240, Repairs & Maintenance, is only $42,000 without further explanation. If this is true we are spending lot of man hours to accomplish $42,000 worth of repairs. • Line item 450, Water, on page 73 shows personnel budget of $571,558 yet line 240, Repairs & Maintenance, is only $40,000 without further explanation. If this is true then we are budgeting $1,237,428 in labor to complete $82,000 worth of repairs. • Note – Snow & Ice is not included the budget, however, according to Open Checkbook the Snow & Ice cost for FY15 was $763,229 with $179,346 of that consisting of employee earnings. Page 70 of the budget lists DPW employee earnings at $1,929,129 with DPW personnel $752,451; Sewer personnel $631,625 (page 71) & Water personnel $552,053 (Page 73). We can’t find how this snow and ice money is in the budget as presented. • We know that other departments are paid through Water & Sewer including the Treasury Department (page 38) yet there is no indication of any money from Water & Sewer paying any portion of the Treasury Department’s personnel. We are not insinuating that the Treasury Department is doing anything wrong but as taxpayers we deserve to see direct correlations to where our money is being spent. • The School Department (page 13) although very thorough, until Tuesday April 28th consisted of one line in the budget; Line item, 300 Public Schools – $25,803,516. Grant money is listed as $3,457,000 bringing the budget to $29,260,516. This number excludes pension cost and health insurance (as do all other department budgets); however, this makes it difficult to determine if we are spending enough money on the schools. One question that we have, that we are sure can be easily explained, is on page 14 -District Wide Instruction- which is budgeted at $3,580,200. This number ties into the breakout on page 17, however, page 14 also list $1,470,000 in grant money to District Wide Instruction for a total of $5,060,200. We are unclear where that money is being spent as it no longer reconciles with the breakout on page 17. This is consistent with all of the grant money. • We fought to have three police officers added to the budget this year so we can begin to bring our public safety FBI recommendations up to standard. Unfortunately, two of the requested officers were eliminated from the final budget. Stoneham has police officers retiring soon and need to be proactive just to keep the ranks on par. We were unable to clearly see why this was necessary and where the funding for the eliminated two officers was moved. • We have grave concerns with the golf course. The Open Space & Recreation Committee presented at the BOS meeting of April 28th. They illustrated a steady decline of revenues at the golf courses. In 1999 the revenues from both courses were close to $1,000,000 with a profit of over $500,000 and that profit included a now paid off mortgage on the Oaks. Despite this, over the last 14 years revenues have shrunk to around $425,000 and the golf course is now operating at loss and has been for the last couple of years. If we had a detailed budget during this time we would have caught this trend and corrected it before suffering these staggering losses in revenue. This lack of full disclosure leaves too many unanswered questions. In past years the W&S rate was actually set after the budget was approved without explanation, you would simply find out when you received your bill. This practice goes against our bylaws. These are just some of the reasons some members, not all, of the BOS felt it prudent to not simply accept the budget we were presented, to accept it without a thorough review, and to accept it without asking these kinds of questions. It was because some of these questions were asked at all that during Town Meeting some Selectmen questioned the validity on voting on Article 17 which was to take an additional $200K from the Sewer Enterprise Fund (which did not have any financial back up) and put it toward sewer repairs when Article #18 which was to vote on accepting $800K in the form of a 75 % grant and 25% 0% interest loan was being taken. If we were already voting to accept a grant/loan for sewer repair then why were we taking an additional $200K out of the reserve account? It was only because the Selectmen had a few days to review part of the budget, not all, that the Selectmen caught this and moved to IP Article #17 as well saving taxpayers $200K. This is the BOS budget and we can no longer blame past boards for past financial decisions. We take your tax dollars very seriously, and like you, we want to be sure we have ample opportunity to see where your money is going, to outline income and expenses for each department in a presentation that is easy to follow so that you can exercise your right to amend the budget and ask questions on the floor during a vote. This is what we were promised and this is what we expected. We do have Open Checkbook, a tool that shows all expenses, but it does not show income and it does not allocate all debits and expenses neatly under each department for ease of viewing. Selectman John DePinto did not agree with the decision to IP Article #6. He felt strongly that the budget has had the same practice for the past 15 years, that we have paid positions who are compensated to put the budget together for us, and that we should accept what they present on our behalf and that the BOS should encourage voters to accept a budget that has no explanation. This is Selectman DePinto’s right and we respect his position. Several other people in attendance also questioned and chastised the remaining BOS members for taking this stand as the budget has been voted the same way for the last 15 years. Respectfully, we believe that full disclosure is your right and that you should see how your tax dollars are being spent, how, and where. It is our intention to pass a budget before the close of the fiscal year. None of the work done by department heads will be lost, and we appreciate their efforts. We just thought you deserved an explanation of why we took the action we did. Yesterday’s blog post regarding the Weiss Farm site walk with the Conservation Commission resulted in a number of great responses, both via email and in the post’s comment section. 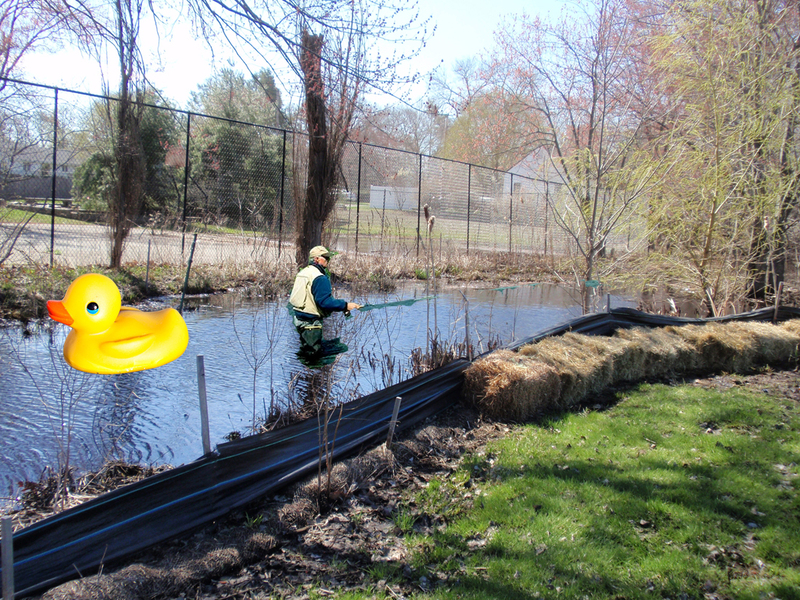 Your pictures on SCY are very compelling and definitely help to illustrate how grave the situation is at Weiss Farm. Thanks for sharing your talent to reach more people. One thing all citizens of Stoneham need to understand, whether they live near Weiss or not, is the sheer magnitude of this development. Below is the prototype for Weiss Farm – the Commons of Lynnfield. Note that the building is too large to fit in the photo. There are 3 of these buildings planned for Weiss. 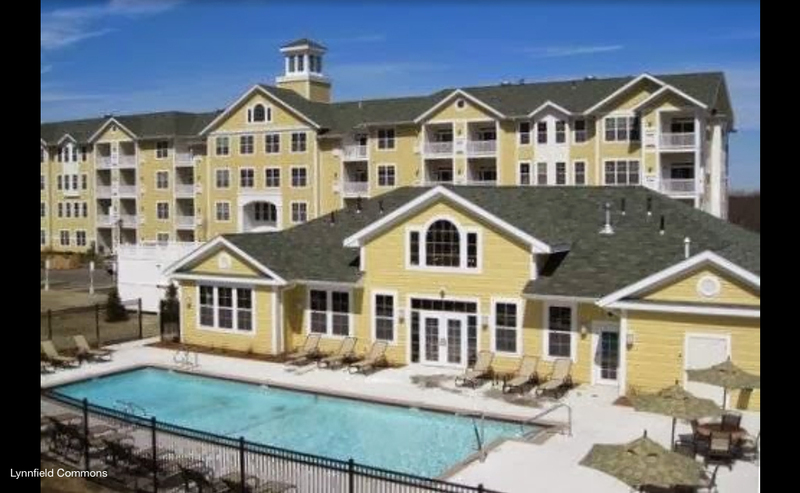 The photo below is the Corcoran development in Lynnfield along Route 1, a major highway. This is the model for Weiss Farm, the only difference is that the development on Route 1 is actually SMALLER than what is planned for Weiss. Now imagine the weight of three of these buildings, a clubhouse, a pool, and a parking lot which will accommodate almost 500 cars on the site at Weiss. What do you think will happen to the water when this weight is put upon the site? If anyone has a good camera and can take photographs of the Commons at Lynnfield and blow them up to truly illustrate what we are facing, more people might take notice. Wow, what a day! Actually, what a past few years!! 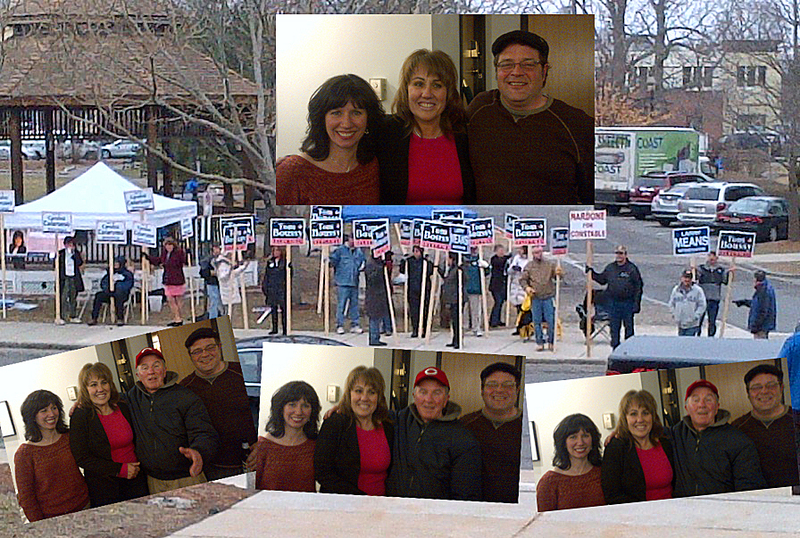 The hard work and tireless passion for our Town has paid off with three victories tonight. Congratulations to Tom Boussy, Caroline Colarusso and Larry Means!! Today marks a huge leap forward with the continued work of Larry Means as Town Moderator and the addition of Caroline Colarusso as Selectman. Tonight I’m even prouder to be a part of the Stoneham community. In case you haven’t seen it, I invite you to read this email regarding both candidates from Selectman Ann Marie O’Neill. 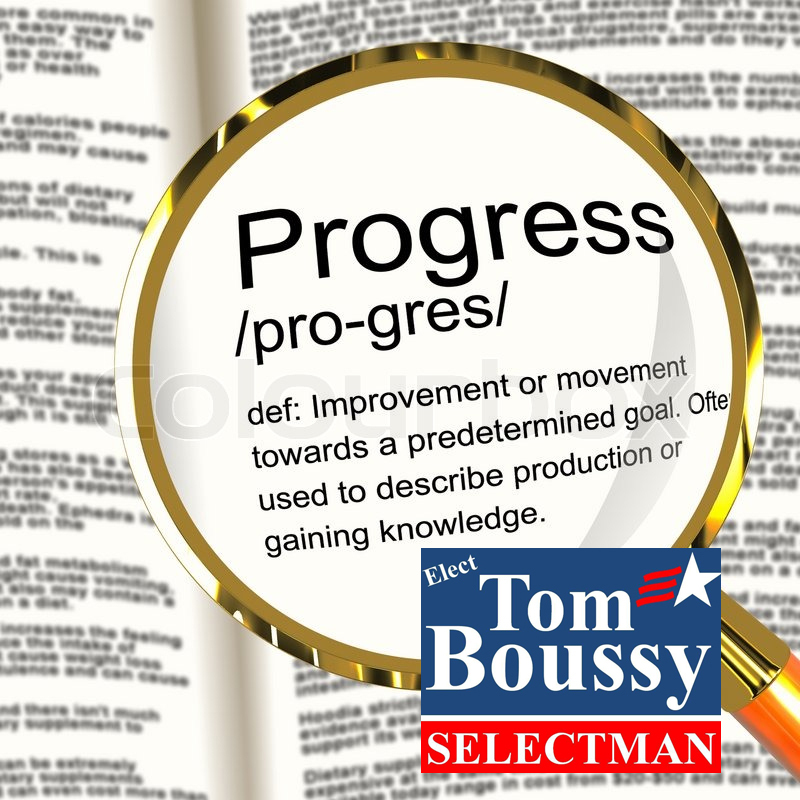 Personally Tom Boussy has my vote. Three years ago Tom stepped forward as a complete unknown. Tom questioned why we weren’t doing better as a community, why our services were decreasing and our fees increasing. 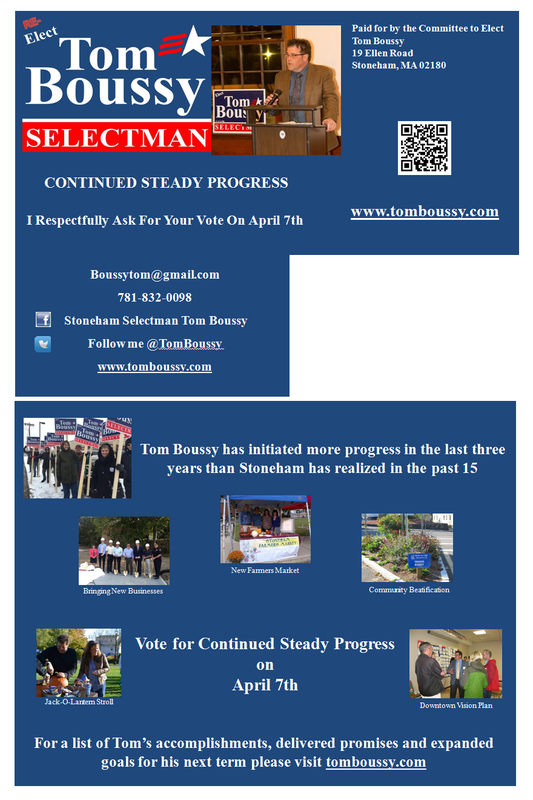 In three short years Tom brought unprecedented reform, budget transparency, and innovation to Stoneham. I would like to see our community continue in this direction. 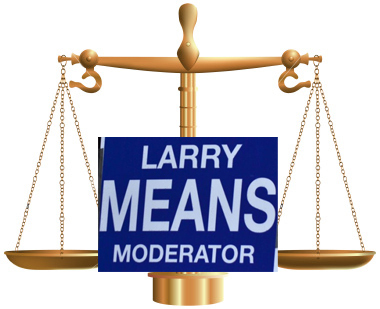 The Moderator is another important, contested position up for election. The Moderator presides over Town Meetings, is required to keep order, and have an intimate understanding of Robert’s Rules of Order – the practice Stoneham abides by during Town Meeting. In addition the Moderator appoints members to the Finance and Advisory Board and the Bike Committee. 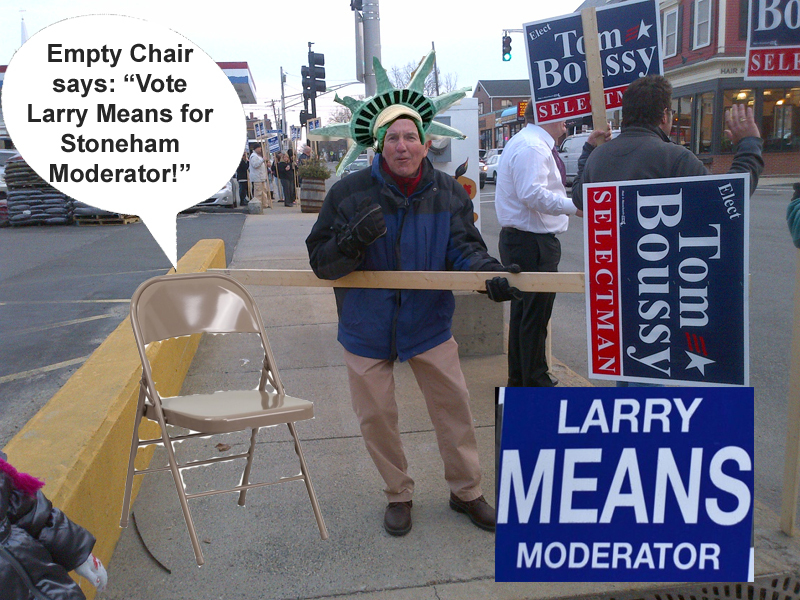 Current Town Moderator, Larry Means, was the only candidate to show up for this portion of the Candidate Forum. I have seen Larry keep order during meetings that were spirited. He is fair, respectful and understands the format to which our town subscribes. Larry has my vote! See you at Town Hall tomorrow! Next Tuesday, April 7th Stoneham residents will vote for two candidates to represent their interests on the Board of Selectmen. This is a big race because 40% of all decisions made over the next three years will be made by whoever holds these two seats. Recently the candidates participated in “The Candidates Forum,” more popularly known as “The Debate.” I have included the link below, the first 18 minutes is the Moderator’s debate. Thank you for your time. As always, please feel free to share, and please vote on Tuesday, April 7th!